I was rather disappointed when I got to the end of the first volume of The Ultimates to find out that the team had been disbanded because of silly human drama reasons, for lack of a better term. They were one of my favorite things to happen since the likes of The Annhilators, which was an extremely strong team that tried to deal with threats in a proactive manner. The Ultimates were just the smarter version of that. But lo and behold we get The Ultimates 2, with the team coming back together in secret in order to continue their big mission of keeping Earth safe by going out to find possible threats. And as this is the team that managed to turn Galactus from the world-eater to the life-bringer, so they're nothing to be sneezed at. I was not expecting the level they were going to take this book based on how the first one had gone. I felt the events of Civil War II had really muddied things up for a lot of comics at the time and it sort of shifted the storytelling. This second volume isn't so constrained and manages to takes things to an entirely new level indeed. 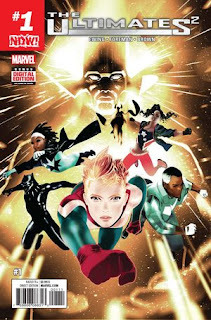 Synopsis: The Ultimates 2 is the continuing adventures the titular team as created by Al Ewing. The core team remains the same but the threats are entirely different. The core thrust of this volume of The Ultimates is Galactus taking a more active role in things as he calls on the Ultimates to aid him - an interesting reversal from when he was the problem they were trying to solve. Given the multiverse-changing events of Secret Wars II, it seems that reality isn't quite as strong as it used to be and somehow Eternity, the cosmic personification of pretty much everything, was being weakened or even attacked somehow. And it is up to the Ultimates to help out. But given the events of the first volume, their actions haven't been going unnoticed and another team known as the Troubleshooters are sent to investigate the activities of the individual members and confirm if the team is operating again. They're not exactly lightweights either and have a formidable enough power set to give the Ultimates a run for their money. What I Liked: I have super appreciated how this comic has really tried to explore Marvel's cosmic realm including digging up some more obscure characters from the past and giving them a lot more character. We had already seen the likes of the Anti-Man in the first volume and this comic gives him a bigger role to play in things. And with Galactus forming his own super team of cosmic entities to face off the threats against Eternity kind of blows the mind. The meta-narrative at work here is mind-boggling as well and you know things are going to be even crazier when the likes of the Queen of Nevers from the Silver Surfer comics get involved in the story. And that sort of clever writing and good use (and choice) of characters to bring into the craziness is pretty brilliant indeed. What Could Have Been Better: The Earth side angle of trying to rein in the Ultimates is understandable but never my favorite part of this series. They act as a weird B-side antagonist plot that adds noise to the overall circumstances of what's going on and while the fight was great the overall logic of things wasn't my cup of tea. The biggest challenge of dredging up more obscure characters from Marvel's history to flesh out the cast is that a lot of times you'll be wondering if this is a new character created for the series or someone else dug up from the past. So for great fans it's a chance to research and find out about these older characters and their stories. For others it might just be a head-scratching moment as you don't immediately understand who they are and what they're capable of power-wise. TL;DR: The Ultimates 2 is still a solid cosmic romp and an overall adventure that I really enjoyed. It may be a bit of a niche interest comic as far as Marvel is concerned but I still found it to be quite the fulfilling reading experience. Thus the comic gets 5 cosmic entities going to war out of a possible 5.